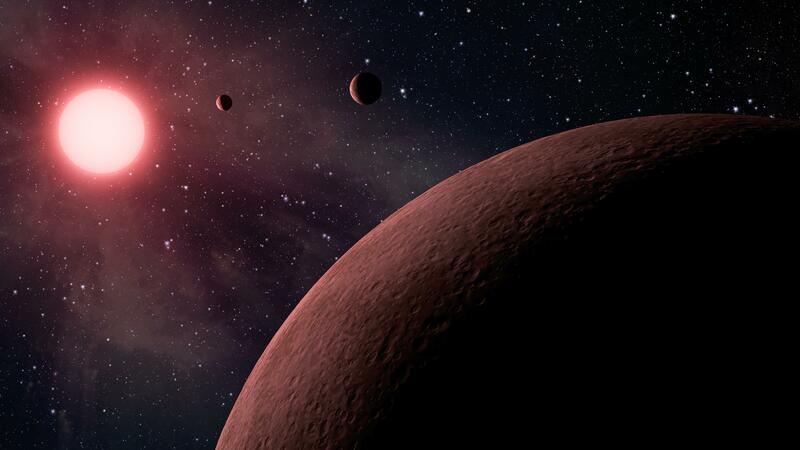 Noticias / Scientists find a new extra-solar planetary system. Scientists find a new extra-solar planetary system. It comprises at least three planets with characteristics similar to those of the Earth and orbits around one close star. A CONICET’s researcher participated in the find. A recent study published in Astronomy & Astrophysics revealed the existence of a multiplanetary system close to the Earth –at only 12 light years away or 3,7 parsecs– around the YZ CET star. Despite the fact that none of the planets that comprise it could be inhabitable –the radiation level they receive does not indicate the presence of liquid water– certain characteristics of these bodies show that they can have a structure similar to the one of the Earth. “These planets have masses that look alike the ones of our world, what leads to assume that they are also rocky and that their size cannot be different from the Earth. The scientists could also affirm that it is a compact system, that is to say that the planets that comprise it are separated but close among them”, Rodrigo Díaz states. He is a CONICET’s associate researcher at the Instituto de Astronomía y Física del Espacio (IAFE, CONICET – UBA) and one of the authors of the study. YZ CET has a mass equal to about 13% of the Sun’s; therefore it is cold and weak. However, its closeness to the Earth makes it bright, what facilitates the work of the researchers. In fact, it is the closest planetary system found so far. Despite being weak, small and colder than the Sun, the planets of that system receive more light radiation from YZ CET than the Earth because they are closer. “To give you a rough idea, those three planets take 1.97, 3.06 and 4.66 days to orbit its star”, Díaz comments. That closeness is what makes the researchers conclude that in none of those planets can be found water in liquid state, what places them out of the area of habitability. These bodies were detected for the effect on the star through the system of radial velocity. “The stars are moved by the effect of the planets, so we measure accurately the speed of those movements, but only the speed in which the light body comes closer or away from us. Thanks to those measures, we can reveal the existence of the planetary systems without the need to see them directly”, the scientist explains. “It is worth mentioning that these planets are the less massive we found through this method. Furthermore, this is also the first compact planetary system discovered through the radial speed system”, Díaz states. N. Astudillo-Defru. Université de Genève, Switzerland. R. F. Díaz. Associate researcher. CONICET. IAFE. X. Bonfils. Université Grenoble Alpes, France. J.M. Almenara. Université de Genève, Switzerland. J.-B. Delisle. Université de Genève, Switzerland. F. Bouchy. Université de Genève, Switzerland. X. Delfosse. Université Grenoble Alpes, France. T. Forveille. Université Grenoble Alpes, France. C. Lovis. Université de Genève, Switzerland. M. Mayor. Université de Genève, Switzerland. F. Murgas. Instituto de Astrofísica de Canarias, España. F. Pepe. Université de Genève, Switzerland. N. C. Santos. Instituto de Astrofísica de Canarias (España) and Universidade do Porto, Portugal. D. Ségransan. Université de Genève, Switzerland. S. Udry. Université de Genève, Switzerland. A. Wünsche. Université de Genève, Switzerland.